Black Seed Oil Market size was over USD 15 million in 2018 and industry expects significant gains by 2025. Growing demand for pharmaceutical products with natural ingredients owing to their benefits and non-toxic nature is likely to propel black seed oil market size by 2025. These products are sourced from nigella sativa plant, which exhibits active compounds that can be used for medicinal purpose. Black cumin seed oil is a source of unsaturated fatty acids, which helps in boosting immune system and improving digestion. These factors are likely to further propel product demand in forecast timeframe. Black cumin seed oil is used for health benefits owing to its ability to support well-being naturally. These products are purely organic and are extracted by cold pressing without any extraction. Growing preference natural ingredients in numerous sectors including pharma, personal care and food in likely to drive product demand in forecast timeframe. Cumin seed oil contains numerous vitamins and nutrients including B1, B2, B3, calcium, folate, copper, phosphorous and zinc, which helps in supporting different body function including immune system. These products also contain low calorie due to which it can be used in cooking and flavouring, thereby stimulating industry size. Black cumin seeds and its essential oil have been widely used in functional foods, nutraceuticals products. These products contain p-cymene, thymoquinone, α-thujene, longifolene, β-pinene, α-pinene and carvacrol, which are essential in the formulation of nutraceuticals products. Nutraceuticals market is anticipated to surpass USD 550 billion by 2025, owing growing consumer awareness and e-commerce, which is anticipated to drive black seed oil market size. These products contain thymoquinone, which may exhibit tumour reducing properties. It can be consumed in the form of oil and capsules or can be applied topically in order to treat skin problems, thereby propelling product demand. Growing demand for high quality natural product in bakery in order to formulate functional foods is likely to stimulate cumin seed oil market size. These products also help in relieving respiratory symptoms and eczema. Additionally, it may be used in treatment of rheumatoid arthritis. According to research product usage in treatment led to a reduction in arthritis symptoms, number of swollen joints and blood levels of inflammatory markers, thereby stimulating the market size. However, applying these products directly to skin may cause allergic contact dermatitis in some individuals and presence of melanthin in the product may be toxic in larger amount. These factors are likely to hamper industry profitability, thus affecting black seed oil price trends. Black seed oil market size is anticipated to surpass USD 25 million by 2025. These products offer health benefits naturally and does not have significant side effects. Growing demand for natural ingredients in pharmaceuticals in order to minimize usage of chemicals is anticipated to fuel product demand. According to research kalonji oil reduces inflammation and presence of bacteria to aid in wound healing. It does not grow new collagen fibres; however, it does stimulate growth factors to help body maintain healthy skin, thereby propelling product demand. Black seed oil market size from personal care & cosmetic application is projected to surpass 700 tons at the end of 2025. These products contain high level of anti-oxidants and radical scavenging constituents like carvacrol and t-anethole which can be utilized in protecting skin from harmful radicals in the environment. Topical black seed oil is effective in remedy for uncomfortable and dry skin. These factors are likely to propel product demand in personal care & cosmetic application. Black seed oil industry size from pharmaceuticals application is anticipated to witness gains of over 6% owing to its numerous health benefits including asthma, allergies, headaches, diabetes, high blood pressure, rheumatoid arthritis and digestive disorder. According to research, constituents in the product can influence brain and skin cancer cells, thereby stimulating product demand. 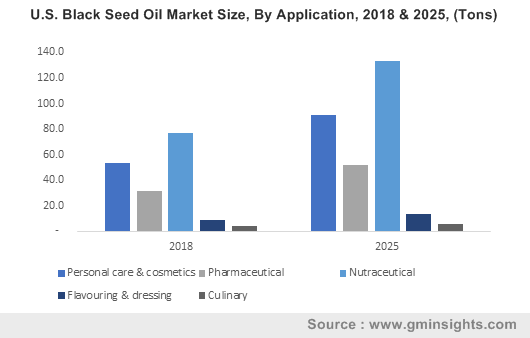 Asia Pacific led by, South Korea, Australia, Japan, India and China black seed oil market size is projected to surpass USD 10 million up to 2025 owing to growing plantation of nigella sativa in the region. These products are used in flavoring for curries and bakery products along with application as food supplement, where it is reported to reduce cholesterol and glucose level, thereby driving product demand. 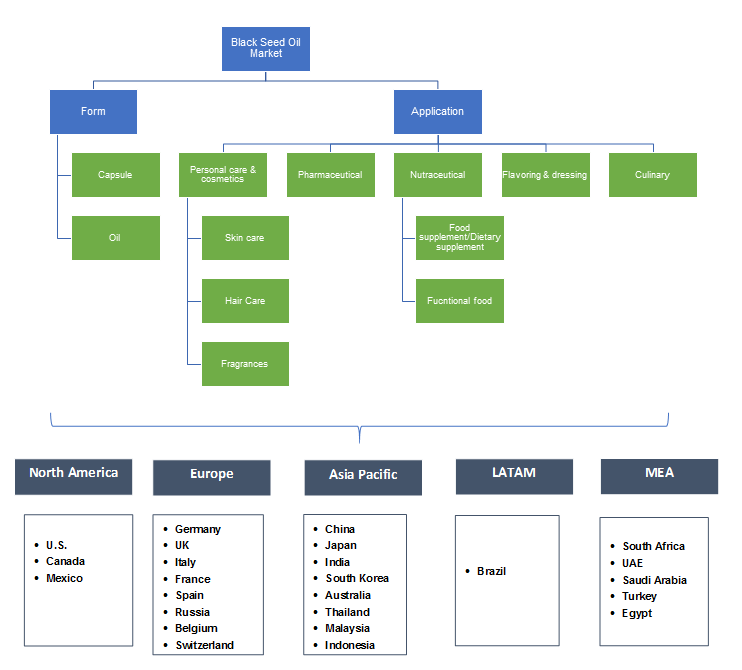 Growing nutraceuticals market in India, Japan and China is anticipated to fuel regional demand. Europe driven by Russia, Italy, UK, and Germany black seed oil industry share may observe gains of 6% by 2025, owing to growth in personal care & cosmetic market in the region. Strict regulation for synthetic ingredient in cosmetic & personal care product along with shifting preference towards essential oil’s including black seed is anticipated to stimulate product demand by 2024. Brazil black seed oil market size is anticipated to witness strong gains owing to growing demand for natural products. Mounting cosmetics market size in the region due to increased number of working women is likely to propel product demand in forecast timeframe. Global black seed oil market share is fragmented and competitive with major industry players includes Manish Agro, Safa Honey Company, Sanabio, Sabinsa Corporation, Z-company, Kerfoot Group and AOS Products. Companies are involved in sourcing quality raw material in order to manufacture value added products and new industry participants are anticipated to enter this industry owing to its growing applications in food and pharmaceuticals. Black seed oil is an essential oil extracted from cumin seed also known as Nigella sativa. These products are widely used in major industries including food, cosmetic and pharmaceuticals owing to their natural extraction and numerous health benefits. Nigella sativa oil is used to treat condition like headaches, diabetes and digestive disorder. In regions including Middle East & Asia Pacific, these products are used in different cuisines or sometimes sprinkled over bread to provide taste and flavour. Historical data coverage: 2010 to 2015; Growth Projections: 2016 to 2025.